When General Service Administration (GSA) officials created the Connections II Telecommunications Infrastructure Solutions contract for federal buildings and campuses, they applied lessons learned from the first Connections contract to improve the solutions offered and streamline the use of the multiple award contract. The new Connections II contract has been expanded to include federal buildings and campuses worldwide, offers stronger supply chain security, supports sustainability requirements, is easier to use, and addresses the growing need among agencies to consolidate and manage telecommunications technologies that have emerged in recent years. 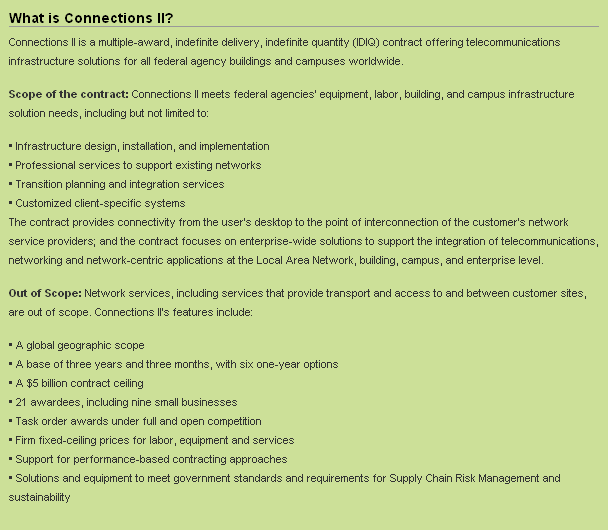 Connections II is a competitive multiple-award, indefinite-delivery, indefinite-quantity (IDIQ) contract with a $5 billion ceiling. Awarded on Oct. 19, 2011, to 21 companies, the contract has a base of three years and three months, and six one-year options for a total of nine years and three months. All federal agencies can issue task orders to obtain telecommunications infrastructure solutions from the contract’s 12 large businesses and nine small businesses. Agencies pay GSA a fee of 1.5 percent of the task order price to use the Connections II contract. Connections II complements GSA’s Networx telecommunications contract, GSA officials said. Networx provides agencies with network services, including transport and access to and between customer sites. In contrast, Connections II covers all of the labor, products, and solutions to support the integration of telecommunications, networking, and network-centric applications at the Local Area Network level across buildings and campuses. “Connections II provides the connectivity from the user’s desktop to the point of interconnection with the customer’s network service providers,” said Debbie Clark, Connections II Program Manager. These four areas are “guidelines, not restrictions,” Clark said, representing examples of the types of solutions agencies can obtain through the contract. “Agencies can choose one of these solution sets or design their own that is within the scope of Connections II,” she said. This approach differs significantly from the first Connections contract, where vendors were qualified to compete in three main categories: equipment and services, support services, and solutions. Vendors could qualify for any one of the categories, or all of them; and agencies were expected to select vendors from each of the categories, depending on their requirements. Although this approach sounded good in theory, it confused both agencies and contract holders, because the distinction between categories wasn’t always clear. “For the most part, our customers just wanted solutions, even if they were small solutions,” Clark said. In addition, under Connections II, all contract holders are qualified to compete for task orders in all areas. This should improve competition because all contractors can compete on an equal footing, said Ray Bjorklund, Chief Knowledge Officer for the research and analysis arm of Deltek. “And if there is broad enough competition, agencies are going to get better pricing,” Bjorklund said. GSA officials also describe Connections II as an “integrator contract” because agencies can use it to coordinate access, transport, and equipment vendors across other telecommunications contracts. For example, agencies can use Connections II to monitor the end-to-end performance of networks or act as a single point of contact. Similarly, under Connections II, agencies can obtain the expertise they need to develop business cases, design the infrastructure for a building, or connect buildings in an Enterprise Wide Area Network (WAN), and then have that Enterprise WAN centrally managed by the contractor. “Connections II is an integrator that can pull together the work on Connections and other contracts to provide a seamless whole, giving the look and feel of everything coming under one contract,” Clark said. GSA officials made other important changes to Connections II. For example, the new contract covers international as well as national buildings and campuses. GSA and industry officials saw a big demand for international work on the first Connections contract, but it was out of scope, forcing agencies to use other contract vehicles outside of the United States. “This was definitely a lesson learned,” Clark said about adding the global capability to Connections II. Another unique feature of Connections II is the ability to include “un-priced items” on task orders. Previously, if agencies asked for items that fell within scope but were not yet priced on the contract, a contract modification might be required to place the items on the contract. But now, agency contracting officers can make one-time purchases of un-priced items without a contract modification by conducting their own price analyses for those items and placing them on the task order. Allowing un-priced items makes the contract much easier for agencies to use, officials said. In the past, some federal observers have questioned the need for the Connections contract, saying agencies can satisfy their telecommunications infrastructure requirements through GSA’s Alliant governmentwide acquisition contract and other contract vehicles. GSA and industry officials acknowledge that there is some overlap in scope between Connections II and Alliant, but they said Connections II provides a stronger focus on telecommunications infrastructure and related services. “Alliant is a very broad spectrum IT contract vehicle, providing agencies with access to a very diverse set of industry partners and capable of delivering customized IT solutions. Connections II, on the other hand, focuses on a narrower scope of services unique to telecom infrastructure solutions in buildings and across campuses,” said Mary Davie, FAS Assistant Commissioner for ITS. Among its benefits, Connections II provides a full telecommunications labor set and pre-evaluated contract line-item pricing for communications and networking equipment, which saves customers the time required to conduct a price analysis, Davie said. In addition, Connections II gives agencies ready access to highly capable and experienced telecommunications prime contractors and hundreds of specialized subcontractors. More than 500 subcontractors participated on task orders in the first Connections contract, and GSA officials expect to have more than 1,000 subcontractors on Connections II. 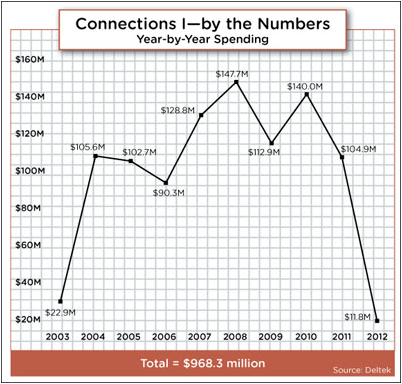 Since the first Connections contract was awarded in 2003, agencies have spent nearly $1 billion through the contract—a large amount of spending but considerably lower than the contract’s $35 billion ceiling. 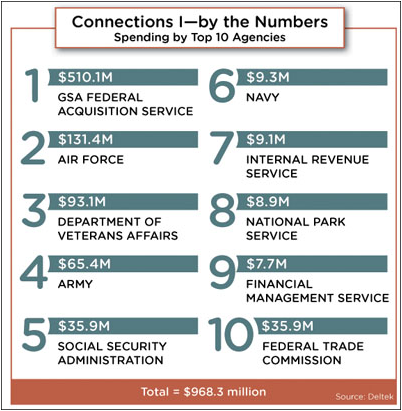 But GSA and industry officials are expecting an explosion of spending under Connections II, which has a more realistic ceiling of $5 billion. In recent years, about two-thirds of Connections task orders have come from existing customers, demonstrating a high satisfaction rate. In addition, GSA and industry officials are poised to conduct stronger outreach and education among federal agencies to alert them to the contract’s advantages. Overall, the most important factor spurring greater use of Connections II will be the improvements that make the contract easier to use, its expansion to include buildings and campuses worldwide, and the growing need among agencies to consolidate and manage new telecommunications technologies.